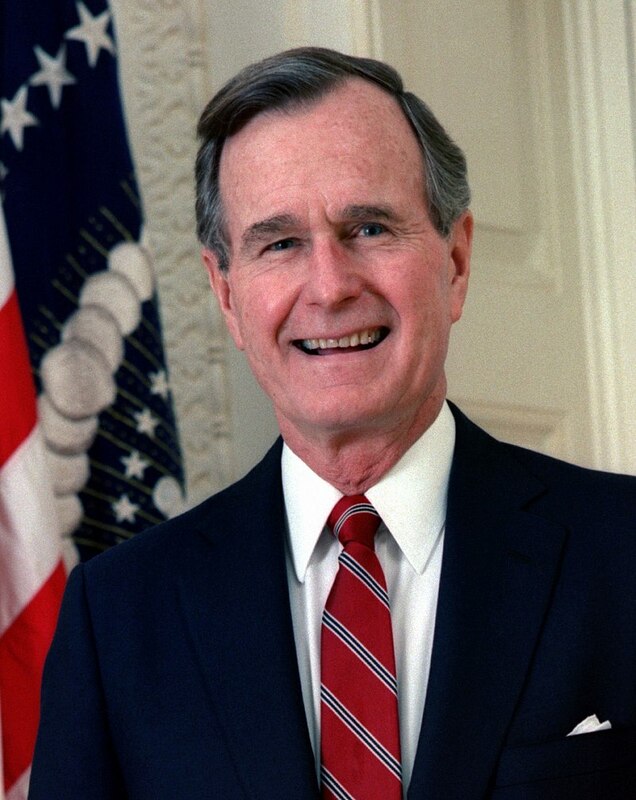 With his passing, George Herbert Walker Bush takes with him a bit of a different America. It is easy to shorthand him as the last of a certain part of politics, as has been done with John McCain. Much has been made of Bush being the last WWII veteran to serve as president. Perhaps that, more than other things, best encapsulates the era passed, when the United States put aside its internal differences to get the job done. Behind all of it, however, was a dedication to service. For Bush, a New England son of privilege, it was noblesse oblige, with all the attendant complications. Yet, it was genuine. It was not for TV gig or to score points. It was service. Bush cannot be let off the hook for his sins of politics and policy. Yet, it seems clear that Bush did not govern from malice as the Republican leaders in Congress succeeded him would. Nor did he suffer from delusions of grandeur that sometimes afflicted presidents from Ronald Reagan to Bush’s presidential son. It need not be stated how better Bush was compared to the current occupant at 1600 Pennsylvania Avenue. The elder President Bush and his wife Barbara, who died April 17, however unintentionally, were something of a rebuke to their predecessors. Reagan, the great communicator, was said to be aloof behind the scenes. Bush was the reverse, and it helped inculcate deep loyalty and love for him and his wife among those who worked for them. Fairly or not, Nancy Reagan did not come off as accessible and down to earth. Barbara Bush comforted a child dying of AIDS. Bush’s idea of service and indeed conservatism included a healthy stewardship of the environment. The Clean Air Act Amendments of 1990 dramatically expanded the nation’s environmental regime. It remains the most powerful extant tools to battle climate change federally. 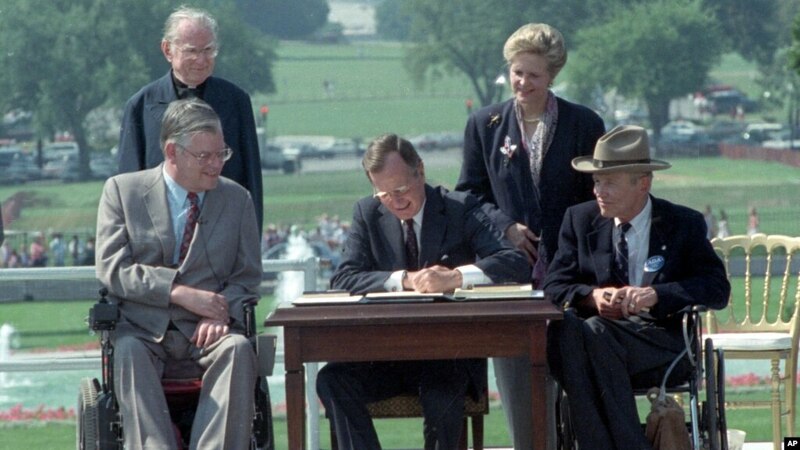 Bush championed the Americans with Disabilities Act, also passed in 1990. Much reviled on the right today, it had obvious conservative virtue. Why should the disabled not be empowered to contribute to their full potential, certainly rather than consigned to charity? Yet, Bush also carried over many of Reagan’s ideas about government’s role in society. Cracks both presidents chiseled into the safety net and a failure to respond to economic changes likely contributed to the economic malaise that felled Bush in 1992. Foreign policy may be where Bush has etched himself into history most deeply. He faced a reordered world in a way no president had since Harry Truman. 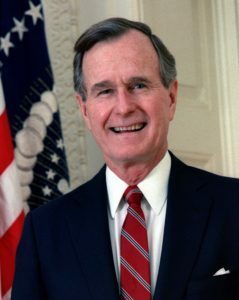 As the Soviet Union collapsed and the Berlin Wall fell, Bush held a world together, within the strictures set after WWII. It is reasonable to ask whether he did enough to help Russia through the transition. Perhaps a few tweaks then may have kept Putin out. But he did the right thing in resisting a coup that tried to remove Mikhail Gorbachev. Nor did Bush shove American values in everybody’s face. Many, if not all Eastern European nations came to embrace democracy on their own. The same commitment to a rules-based world informed Bush’s response to Saddam Hussein’s invasion of Kuwait. Reasonable people can disagree as to whether it was right or appropriate for the United States to engage in a police action of that type. But this blog does not believe his motivation was arrogance, pique or oil. He stuck to the mission and resisted calls to chase Hussein into Baghdad. It’s not all great, of course. His 11th hour pardons related to Iran-Contra are a regrettable and needless stain on his foreign policy record. His own role in the scandal and subsequent subterfuge remain a blot on his record. Despite once campaigning against the Civil Rights Act, Bush turned away from his party’s base to support civil rights bill in housing. He abandoned his no new taxes pledge for the good of the country—only to spurn it later. The way his campaign savaged Dukakis—unfairly in many ways—was despicable. Bush was willing to play dirty in campaigns. History must hold him responsible for that, which seeded some of nihilism we see on the right today. Of course, Bush’s political downfall was not for these reasons. Amid recession, he appeared aloof from everyday problems. It probably wasn’t that he didn’t care, but Americans’ concerns were an intangible for him. The patrician New Englander elitist could not calm a nation slipping into recession. They chose an empathy-radiating Bill Clinton. Nearly 13 years later, Bush would find friendship in Clinton. Reading his letter to Clinton from the day of the transition, it is not hard to see why. Bush believed in the experiment of America, fundamentally. Though he deserves opprobrium for embracing the darker parts of American politics, such behavior is not new. We should not whitewash his errors and faults, but there’s a reason the criticisms of him only go so far. He was in public service for the right reasons and, on balance, he executed well. His life wasn’t a get-rich quick scheme. It was a life of service: as a navy aviator, in Congress, at the UN, at the CIA, vice-presidency and then the White House. We must hope it doesn’t take another calamity like World War II to deliver figures like Bush. But we can also hope and demand better from all our public servants. In doing so we may have leaders who take the trust given to them seriously. But we can also lead by example. That is the Thousand Points of Light. A better world starts with us.